Own a piece of paradise! Charming 3BR/3BA water front home located is in Turtle Cove Swim/Tennis/Golf Course Community on Jackson Lake. Enjoy breathtaking views from almost every room in the house. 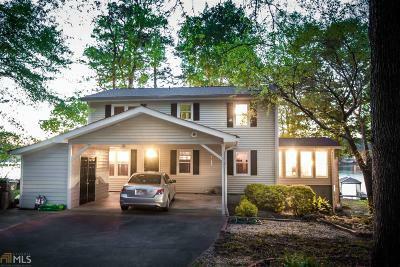 Features include large master bedroom with seating area, 3rd full bath downstairs, kitchen with granite and stainless steel appliances, hardwood floors, beautiful coffered ceilings, extra storage/workshop area under house. Just in time to enjoy all that lake life has to offer this summer! Relaxing evenings on the back deck, days fishing off the dock, swimming or water sports are all waiting for you! Call today for your private showing of this fantastic piece of real estate! Directions: From Atlanta Take I-20 E To Exit 88. Right Onto Crowell Rd. Right Onto S Broad St. Left Onto Ga-162.